It's very unusual to find Zeiss lenses in Leica mount. They were, after all, very very competitive. The demands of war brought new cooperation between the two giants, however. Even so, wartime Zeiss lenses in Leica mount are extremely rare. This 85/2 Sonnar in Leica mount is # 2707147, made in 1941. What might surprise many people is that it's coated. Zeiss invented lens coating and first started using it on selected lenses in 1936. 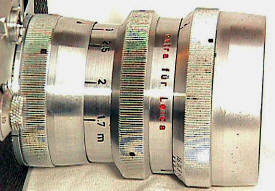 The coating is noted with the characteristic Zeiss red "T" on the filter ring. 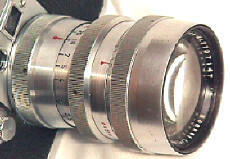 The lens is rangefinder coupled. Unusually, this lens has a robust chrome and brass construction. 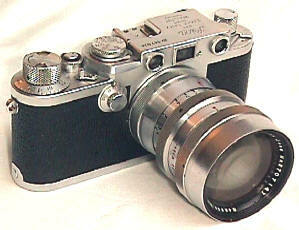 Most wartime Zeiss lenses in Leica mount came later and were made in aluminum due to war shortages. I did further research on this lens by contacting Marc Small, the Vice President of the Zeiss Historical Society, and Charlie Barringer, the President of the Zeiss Historical Society. Both were very interested and very helpful. I learned that this lens is the ONLY lens reported to this time with the "extra fur Leica" engraving. More significantly, it is the ONLY 85/2 Sonnar in Leica mount reported to date made of chrome/brass with this unusual barrel shape. The other 85 Sonnars reported to the Society are aluminum and have the typical straight sided barrels. If you are interested in joining the Zeiss Historical Society, they may be contacted at 300 Waxwing Drive, Cranbury, New Jersey, 08512 USA. Apertures run from F/2 to F/16, with no click stops. The diaphragm has 16 leaves, making a perfect circle to the selected aperture. F/stops are engraved in black, with a red reference mark. Note the RED T, used even on their earliest coated lenses! 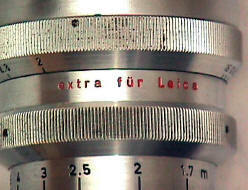 Very interestingly, the barrel of the lens is engraved in red lower case "extra fur Leica." I have never seen any other Zeiss wartime lens so engraved. Marked focus distances in meters are 1.7, 2.5, 4,5, 7, 10, 20, and infinity. The infinity marking and the reference mark are in engraved in red, the rest are in black. One of the most interesting things is that the lens is designed to focus PAST the accurately marked infinity mark -- apparently this had something to do with its intended military purpose. The filter ring is 49 mm. The lens measures a diameter of 53 mm at the filter ring, and 47 mm at the camera end. In infinity position, the lens is 66 mm long from the filter ring to the back edge which would touch the camera. Weight is 14 3/4 oz.